Between the valleys of the Arve and Giffre, facing the Mont-Blanc the visitor is facing a moonscape..., because the Desert Platé offers 2000 hectares of a limestone plateau covered with karren. It covers the cities of Magland, Passy and Sallanches. 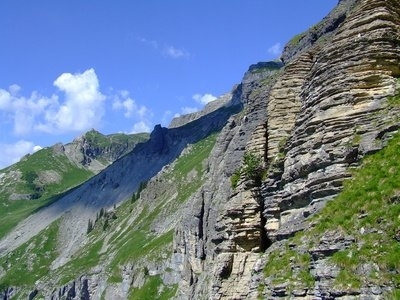 It is a unique place in Europe with a unique geological richness. What is the lapiaz? This original word from Jura, etymologically derived from the Latin : lapis, Lapidis (the stone), refers to a carving limestone outcrops run off by the water or by mechanical erosion (wind). Cracks are formed on the limestone surface and water can leach. The formation of pits or sinkholes is facilitated. Therefore, the Desert Platé is a vast limestone plateau shaped by glaciers and sculpted by meltwater. This Geological singularity earned it a geological ranking in1998 . This extensive mineral saw some animals and plants adapt to its environment. If geology is spectacular, it also provides a rich flora and fauna. The flora includes orchids, gentians, ferns and mosses, while ibex and chamois, golden eagles and other grouse inhabit this rocky area. 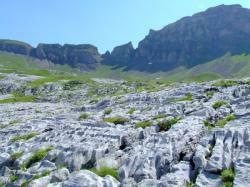 But the site also offers a exceptional panoramic position : south-side, Mont Blanc and west-side the Aravis Massif. At the bend of a chasm, it is not unusual to find marine fossils, evidence of an age (many millions years ago) where the Desert of Platé was immersed in a warm sea! It's a breathtaking scenery which guarantees a good day out in the mountains. Info: Le Fontenay is located 14 km from Saint-Gervais-les-Bains near the Plaine Joux ski resort and sport centre. The residence offers rooms and well equipped 2 and 3-bedroom apartments. Info: The Auberge Les Gorges is situated high up, at the heart of a natural reserve facing the Servoz Mont Blanc range. All the Auberge?s comfortable rooms offer magnificent mountain- views. Info: Offering panoramic views of Mont Blanc, this 2-star hotel is a 20-minute drive from Chamonix, Les Houches and St Gervais-les-Bains ski resorts. It offers a large outdoor terrace and free private parking on site. Info: Located in Flaine, Chalet La Cascade borders the Azurite Ski Slopes and offers a bar, restaurant and terrace. The property is set at an altitude of 1700 metres and the town can be reached within 300 metres.